The rankings are completed for 2015 Long Snappers that participated in the Rubio Long Snapping Spring Camps in IL! Long Snappers in this class came out from KS, IL, and MI to get the best instruction and most exposure for Long Snappers in the country. Hunter Varga was absolutely exceptional all day long and made a big jump in the rankings. His college coach is going to love him for the next four years. Zach Wood is one of the smoothest Long Snappers in his class and passes an eye-ball test very quickly. Michael Bastuga is already impressing me and he is in the 7th grade. Nolan Rossback has an incredible attitude and is very smooth with his snapping. Mike Wojciechowski showed me great form and is excellent under pressure. Charlie Gambs has form that is well beyond his years. Michael Bastuga is showing greatness and he is only in 7th grade! The rankings are completed for ALL 2015 Long Snappers that participated in the Rubio Long Snapping fall Camp in IL. This class of Long Snappers is beyond strong and VEGAS should be an absolute battle. The best 2015 Long Snapper at the camp was Chase Urbach. Chase was throwing back a glorious ball all day with times dipping into the .7s. Very athletic Long Snapper with tons of upside. Hayden Sak easily passes the eye ball test and finished the day very strong. Jake Knight was the winner of the camp with his excellent accuracy and smooth snap. Zach Wood is a strong Long Snapper that might be the smoothest in the country. Owen Gilbert is flat out just a solid Long Snapper with tons of potential. Hunter Varga is fantastic when he just lets the ball rip out of his hands. Jackson Mahorney has excellent balance and built thick. Brendan Lowery is a smooth and accurate Long Snapper that rarely misses. Long Snappers came out to IL on Sunday, March 17th from KY, MO, MN, KS, OH, IL, CT, IN, MI, IA and NY to get the best instruction and exposure in the country for Long Snappers. The talent was the best I have seen this fall in one location. The overall winner of the camp was Tommy Sullivan (IL, ’14). 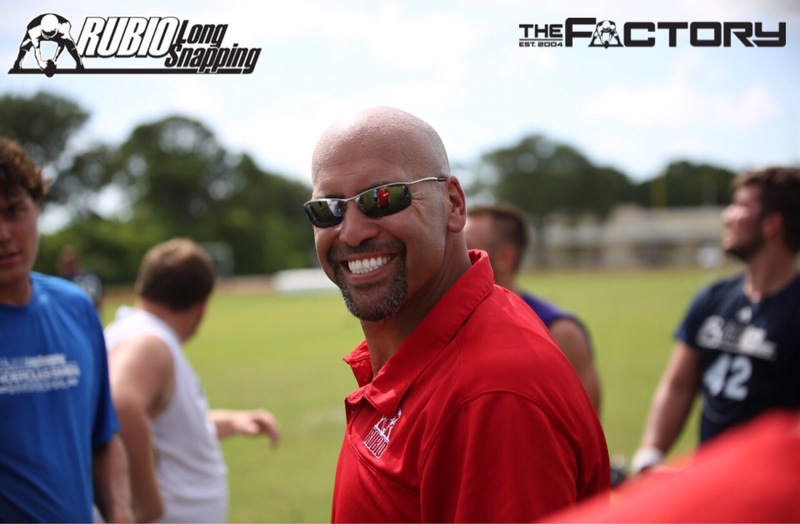 Tommy has improved a great deal since his first camp with Rubio Long Snapping. He has transformed his body and his form is excellent. Sky is the limit for this Midwest Long Snapper. Gabriel Miller (IN) – This Nebraska commit left no doubt the Huskers made a great decision in offering him a full scholarship. Miller ended up losing the entire competition by about a quarter of an inch. He is definitely ready for the next level. Sean Corcoran (IL) – He has really put some good size on and his snapping with confidence. Definitely making a play to really push for the starting spot next year at Penn St. Looked the most solid I have seen him….and I have seen him many times. Patrick Freeze (IN) – This massive Long Snapper was amazing all day. He continually impressed me with his terrific form, hard snaps and confidence. If he snaps like he did in IL when he gets to Vegas, there is NO DOUBT he makes EVENT ELITE. Keep a very close eye on Freeze. Wyatt Pfeifer (OH) – Just continues to improve and improve. Body is thick, strong and solid. His form is excellent and he is snapping as though he knows he is the best out there. Love that attitude when you can back it up…he can back it up. Bronson Bruneau (MN) – Built like a college tight end and snaps like a college Long Snapper. Massive frame that could easily put on another 40 lbs. Huge upside on Bruneau. Dripping with possibilities. Reid Buckingham (KS) – Easily one of the best Long Snappers in his class and could easily be the best IF he gets set. Tons of upside on this very smooth Long Snapper. Great attitude. Nate Hawkins (OH) – Is a very athletic Long Snapper that never stops getting better. Slow and steady, he continues to climb the rankings. Great personality and very coachable. Seth Combs (IL) – A Long Snapper with excellent form that snaps the ball very hard. Needs size to really push for top spots. Potential. Liam was throwing heat all day in IL. Liam McCullough (OH) – He proved, yet again, he is the best in his class. He has put on some great weight and looks different, in a good way, than he did just a couple months ago in Vegas. Liam easily snaps college speeds now and, when he gets through, he never misses. Amazing talent for his age. Nick Janicki (IL) – Might be the most athletic Long Snapper in his class. Improving rapidly and could easily make a play for the top Long Snapper in his class. Jake Knight (MI) – He has D1 size as a sophomore and is close to snapping a D1 ball as well. Powerful Long Snapper with tons of potential. Keep an eye on him. Ben Makowski (IN) – Very thick Long Snapper oozing potential. Very close to being “there” and when he gets there, the rest of his class will suffer. Hunter Varga (IL) – Has really been working on his form and it is paying off. He snaps a smooth ball and will be as good as he wants to be. Snapping hard will be key for Varga. Jackson Mahorney (KY) – Very smooth Long Snapper with great form. The harder he snaps, the better he will be. Built thick and strong. Walsh is well beyond his years with his Long Snapping. Ryan Walsh (IL) – Amazing talent for his age (2018). Form is exceptional and he uses all of his body when he snaps. The bigger and stronger he gets, the better he will be. Handles pressure well. Nate Durham (IL) – Is really impressing me and I almost shocked he is only a 2017. Snaps with great form and solid speed. Great attitude. John Shannon (IL) – Was excellent all day for his first Rubio Long Snapping camp. This freshman has a very bright future with his Long Snapping. Other notables from the camp in IL: Jackson Mahorney, Hayden Grover, Joseph Kramer, Samuel Wilson, Brandon Wolf, Matt Combs, Seth Combs, Clay Chasteen and Jake Hess. Rubio Long Snapping will continue it’s Nike Spring tour on Saturday, April 13th in Charlotte, NC. That camp will be followed by camps in GA and CA all leading up to the 11th Annual National Kicking and Snapping Spring Event in Las Vegas on May 4-5, 2013!